Rain Forest Rescue has been a long-time supporter of efforts to protect the steep mountain slopes surrounding beautiful Lake Atitlan in Guatemala. Working with The Nature Conservancy and a host of local conservation partners, progress is being made to stabilize the volcanic hillsides and preserve the remaining ‘islands of biodiversity’ with their amazing variety of life forms, many of which are found nowhere else on earth. 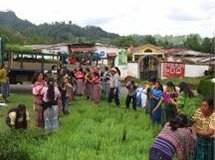 Outstanding among the accomplishments was the planting of the millionth tree as part of the Atitlan Basin restoration project. This impressive milestone was made possible through the generous support by Arbor Day Foundation members, strong connections with local communities, and the creation of local tree nurseries. A tri-national Maya Forest ecoregional conservation plan has been completed, with the significant involvement of local people. A Sustainable Development Plan for the Atitlan Preserve has been completed. Private and municipal nature reserves have been established and/or consolidated into larger tracts of protected land. Fire brigades have been established and over 200 people have been trained in forest fire suppression techniques. Plans call for the production of 500,000 seedlings of three native species in the coming year and the expansion of the restoration work and partnerships with local communities. Unfortunately, threats in the region continue in the form of deforestation, habitat fragmentation, and pollution. Your help is needed to keep moving forward with conservation measures that counter these threats. 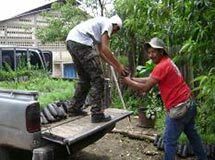 Tree nurseries in three Guatemala communities supplied seedlings for cooperative planting efforts throughout the Lake Atitlan region. 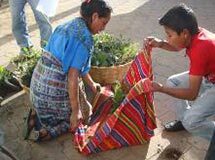 Sixteen Maya communities were involved in the forest restoration activities.